Prominent & Leading Wholesale Trader from Indore, we offer Ht Cables, Mcbs, Cold Shrink Termination Cable, Lt Cables, Electrical Cable and Cables. We are engaged in providing our clients with Primecab HT Cables that are manufactured using high grade raw material and latest technology. These are widely used in various industries like chemical, cement, textile, engineering and power plants. Safe and trouble-free to reset. We provide the best quality shrink termination kit from 3m, suitable for 3 core cable types XLPE/PVC/EPR Insulation, Lead Sheath, Steel Wire Armour (SWA), Galvanised Steel Wire Braided (GSWB) and Phosphur Bronze Wire Braided (PBWB) Cables rated 0.6/1kV up to 1.9/3.3kV. Our customers can avail from us LT Cables that are available in plain annealed copper. All our cables are come in various lengths, thickness and sizes at market leading prices to meet the requirements of our esteemed clients. Further, these are known for their durability, reliability and high shock absorbance capacity. We provide all ranges of Cables from 3M electronics (MSEAL). 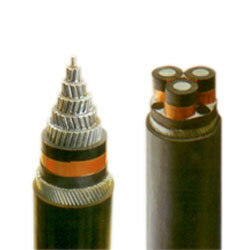 M-Seal / 3M joints and terminations for Low Voltage cables are based on a cast resin system. The casting resin is polyurethane based which has complete compatibility with the cable components. The cast resin system provides the electrical insulation, mechanical protection and moisture imperviousness to the joint.